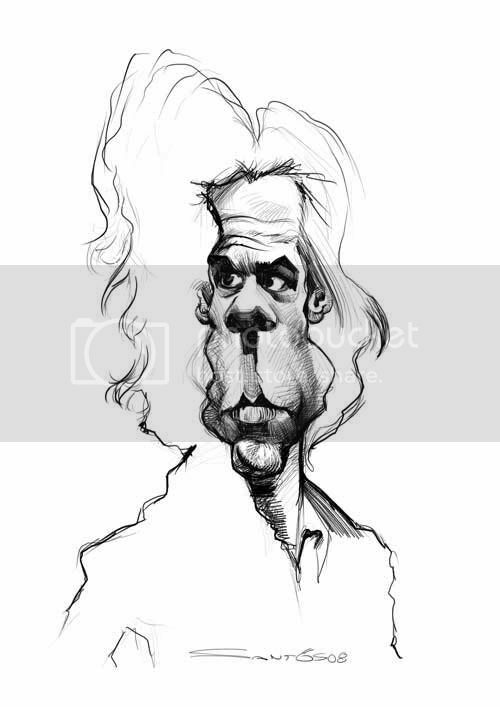 I´m a great fan of Nick Cave's dark singing and depressing style music and like specially his duet song with Kylie Minogue " Where The Wild Roses Grow". Post as well the video from youtube for some relaxing for the upcoming weekend. 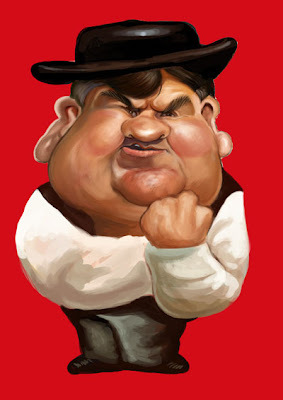 Caricatura do Mario Lino como Jabba the Hutt. O Ministro das Obras Publicas, Transportes e Comunicações faz-me lembrar o verme da Guerra das Estrelas... assim como todos os politicos vermes que me pareçe já estão a mais neste país de zombies. Ele diz que em relação ás SCUT "As negociações estão bem encaminhadas", conclusão? Mais um imposto para pagarmos. VAMOS A ACORDAR PORTUGAL será que ainda não se aperceberam que temos os ordenados mais baixos da Europa e os impostos mais altos para estes *ilhos da *uta andarem a pavonear e a fazer promessas só quando chega ás eleições? Ainda ontem na televisão vi que o preço do pão ia aumentar 50%! *oda-se! 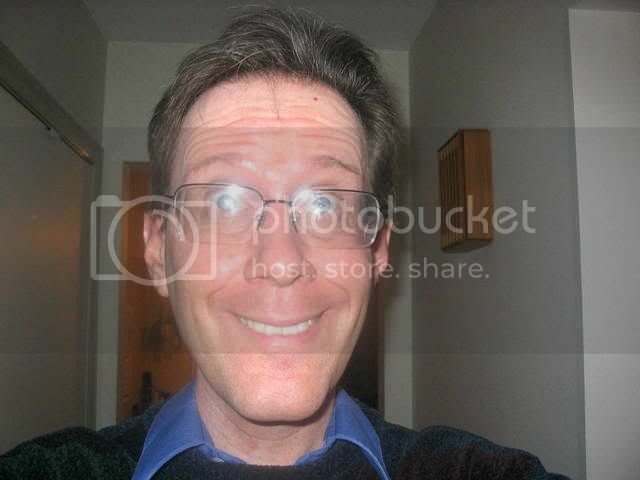 Mas que *erda é esta? VAMOS A ACORDAR PORTUGAL E CORRER COM ESTES POLITICOS DE VEZ QUEM MANDA AQUI SOMOS NÓS!!!! ps: (tinha que ser ps também uff!! Não se pense que eu sou anti-PS simplesmente sou anti-politica). 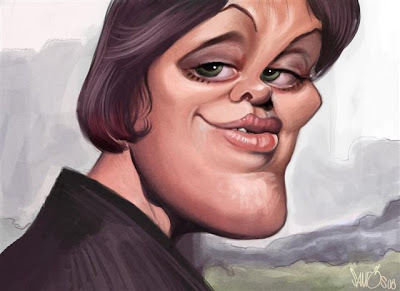 Caricature of the famous German mezzo-soprano Brigitte Fassbaender. 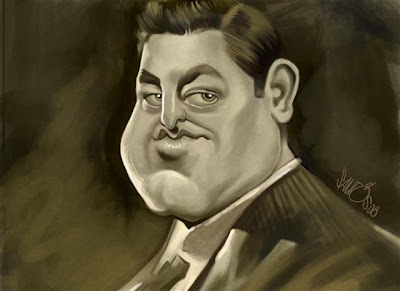 Caricature of the famous Irish-born American tenor, John McCormack. Caricatura Amy Winehouse vem ao Rock in Rio Lisboa os Hoteis que se ponham a pau! 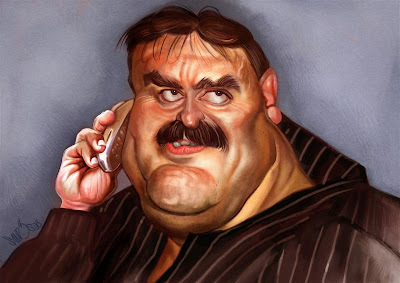 Gift caricature for someone who likes to speak on his mobile phone. 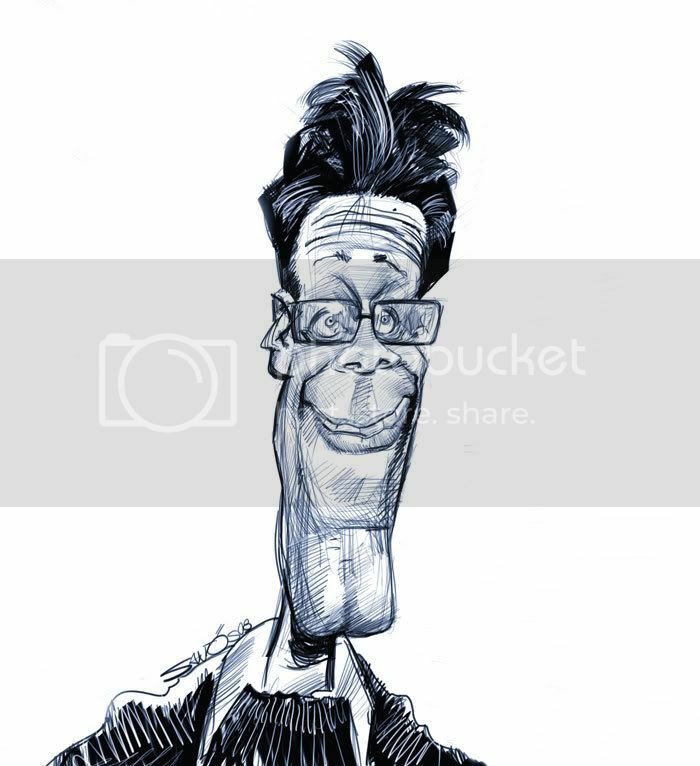 This sketch is fellow UK Caricaturist Mick Hollinworth a extreme talented artist who runs a caricature stand in Alton Towers a famous theme park in the United Kingdom. Here in Portugal we dont have that kind of stuff just taxes to pay or shopping centers... but thats another story. 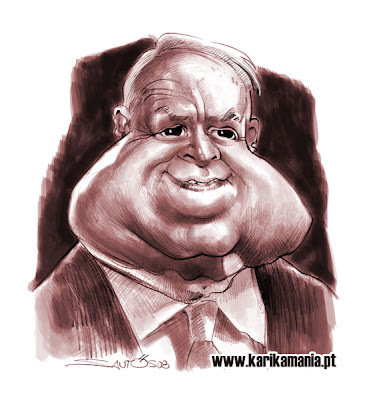 Well everybody seems to be drawing the political candidates for the 2008 presidential election, specially Barack Obama so i decided to give a go at John McCain who seems to be causing some campaign surprises, maybe thats why he endured five and a half years as a prisoner of war, including periods of torture in the Vietnam war in 1967. Could this be another surviver? This is a sketch I did for a competition on the NCN that Jan Opdebeeck is running to win one of his sketches used for his new book Famous Corpses. The white dove on his head wasnt in my inicial idea it just came flewing right after building up his hair i thought it was a funny adition. I'm selling the original drawing on Ebay. 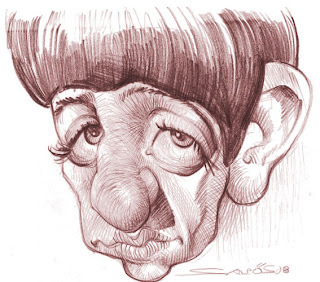 And finally young Ringo Starr's caricature sketch. I will be working on a acrylic painting based on this sketches to practice my skills on this medium. 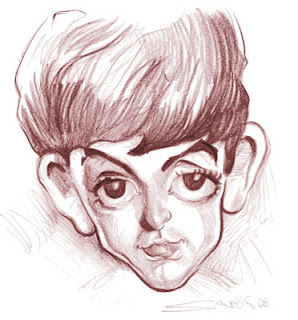 Young Sir Paul McCartney caricature sketch. 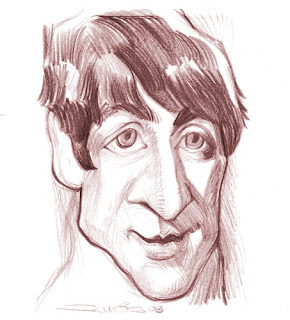 Another take on The Beatles heres a young John Lennon caricature sketch. 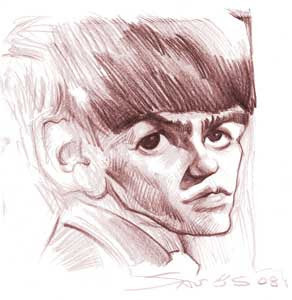 Heres a young George Harrison caricature sketch from The Beatles (isnt this blog informative?). Heres a sexual "Material Girl" Madonna caricature in a cartoony style. Madonna Louise Ciccone Ritchie (born August 16, 1958) is an American pop singer-songwriter, musician, dancer, record producer, film producer, actress and author. She is known for the use of sexual, social and religious themes in her work and has been nicknamed the "Material Girl" and "Queen Of Pop" by the media. Since her debut in 1982, Madonna has released many chart-topping albums and singles, and has sold more than 200 million albums worldwide. Billboard reported that her 2006 Confessions Tour holds the record for the highest grossing concert tour by a female artist. According to both the 2007 Guinness Book of Records, and Forbes, she is the top earning female singer in the world with an estimated net worth of over $325 million. In 2001, the Guinness Book of World Records listed Madonna as the "World’s Most-successful Female Musician". She is the 2nd most successful top selling female artist in the US according to the RIAA, and 15th biggest selling artist overall In the UK she is the most successful female in the UK album chart history, having sold 3.9 million copies of her compilation The Immaculate Collection there alone. In 2005, she tied with Elvis Presley's record of 36 top 10 hits on the Billboard Hot 100 charts, the most for any rock artist. 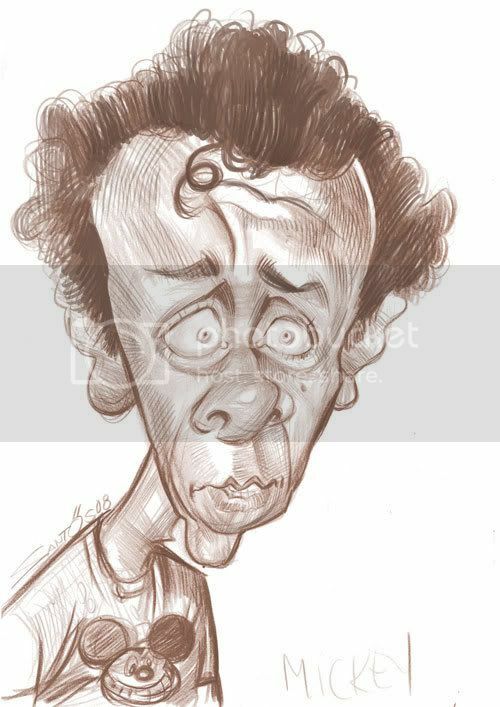 Caricatura do Ministro do Ambiente Nunes Correia. 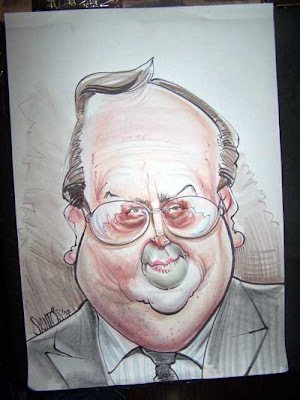 Esta caricatura foi desenhada ao vivo em 2007 no Restaurante Faz Figura,(quando estava a fazer o aquecimento), a partir de uma foto numa revista (julgo que a Sábado) e curiosamente estava no restaurante uma senhora que era sua secretária, ofereçi-lhe a caricatura para ela entregar ao próprio, nunca cheguei a saber da reação do Ministro nem se ele gostou ou não da dita mas foi uma história bem engraçada e que só prova que vivemos num país bem pequeno á beira mar plantado. 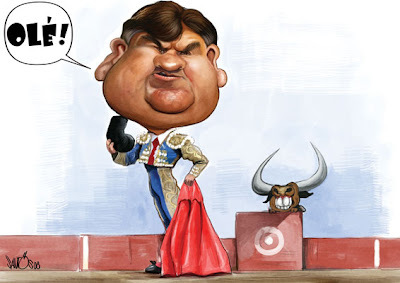 Caricatura de Camacho para a Revista Futebolista de Fevereiro. Já nas bancas por menos de 2€. 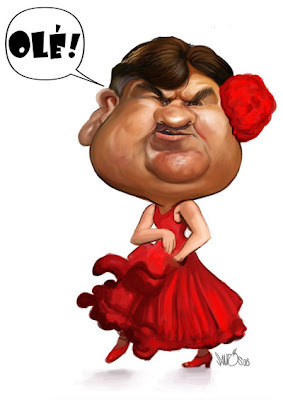 Flamenco que foi logo rejeitado mas que decidi partilhar aqui.